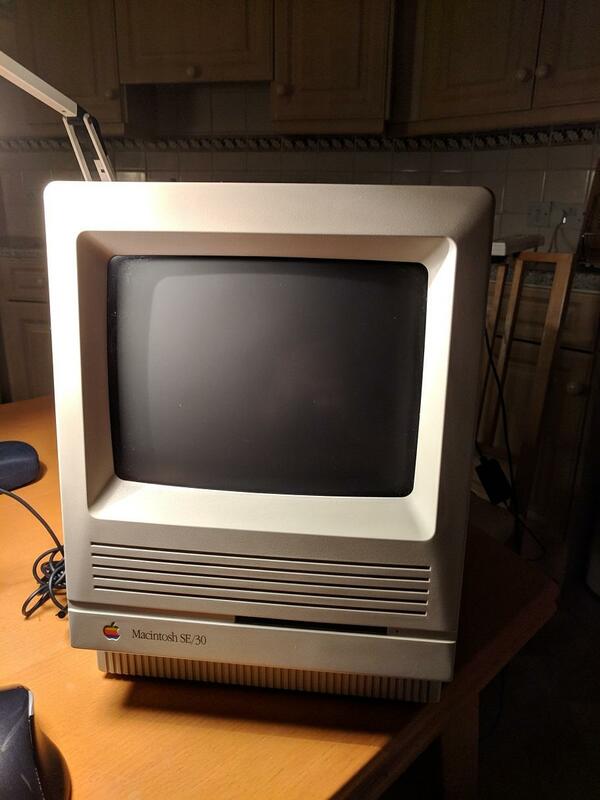 I have one an old Mac SE/30 in the lounge and during a moment of inspiration thought about turning it into something retro-cool. Essentially I have a ton of old consoles in my man den that I will eventually have to part with many to save space. However if I could strip this down pop a small screen and a decent emulation system into this box how cool would that be? So begins Project iGame! So first thing is get my exam out of the way on Wednesday(!) meantime I'll order a long screwdriver to get the screws out of the back of the thing. Once I have stripped it down I can work out what I can do... Also going to frame the Mac's motherboard for wall mounting for the eventual retro man den so won't be wasting it!!!! Jaguar - ha only joking is there even an emulator? So what is the best out there at the moment for anyone tinkering with such things? Nice! I guess you're going to replace the mono CRT with a flat panel monitor. Got any in mind? A Raspberry Pi won't do GC so if that's a deal breaker, I reckon you could fit a MicroATX board in there and go the PC route. You'll have to measure the internal dimensions for that (mATX boards are 24 x 24cm). A flat panel in this would be a shame - Can you get a colour CRT that would fit? Have you set yourself a budget? One idea for a display is to scavenge a panel from a dead laptop. I think the YouTube channel DIY Perks has a video on doing this. I was looking at maybe one of those Intel NUC things but they are looking a bit pricey... Defiantly want a SSD in there. This project is still ongoing BTW not much progress at the moment.. just been stripping the chassis out.... Decided not to go for a CRT. Too much faffing around trying to get stuff working with it (and high voltages involved!!!). Assuming the mac still worked before you gutted it, and this being the retro folder and all, I must say it seems a shame to destroy a nice piece of retro hardware, unless you have actual skills you`re confident in and a lot of time etc to invest, in which case I still think it`s a bit of a shame to gut that computer to turn it into a raspberry pi emulation box with an lcd screen. The way I think about these things is if you kept it as is(was, too late I guess), in 10 years you still have an old mac, which is of interest/value to some people, even if you don`t personally have any interest. Turn it into a raspberry pi with a cheap lcd screen and in a few years you have a piece of junk that nobody wants. I haven't actually gutted the machine yet... And I was actually pondering the same thing myself on this project.